Habitat for Humanity — Partnered with Crystal Coastal Habitat for Humanity and other area Rotary Clubs to build a home for a deserving family in our community. Hurricane Relief — Provided financial assistance for victims of Hurricane Sandy and numerous other hurricanes and tornadoes in previous years. 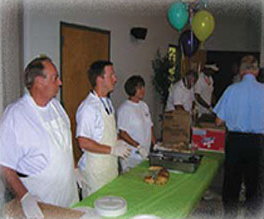 Rotary Civic Center — A dream realized through the generosity of club members, families, friends and businesses, the Swansboro Rotary Club maintains this facility for use by community members and organizations. Dictionaries — In cooperation with other Onslow County Rotary clubs our club participates in providing personal dictionaries to all third graders in Onslow County Schools. College Scholarships — A cornerstone of our service projects, Swansboro Rotary has awarded approximately $800,000 in college scholarships to graduating seniors from Croatan, West Carteret and Swansboro High Schools since 1985. Literacy — Sponsor of Onslow County Literary publication and Carteret County Literacy Council spelling bee. Rotary Youth Leadership Awards (RYLA) — Sponsored four high school juniors to weekend leadership conference at Pine Knoll Shores. BackPack Friends — Provided financial assistance and supplies BackPack Ministries to ensure approximately 120 school children had food during weekends. Sponsors for Academic Talent, Inc. (SAT) — Provided financial assistance for scholarships awarded by SAT to students from Onslow County high schools. Take-A-Kid Fishing — Partnered with Take-A-Kid Fishing Foundation to provide a day of fishing, fun and food to over 200 deserving children. Take-A-Kid Shopping — Sponsored and chaperoned by club members and friends, 20+ deserving children spent a day shopping for clothing at Penneys and Sears. Job Shadow Program — Seniors from Croatan and Swansboro High Schools “shadow” club members and other local businessmen for a day to learn more about vocations in our community. Boys and Girls Home of N. C. — In concert with other area Rotary Clubs, our club provides financial assistance to help maintain a “Rotary Cottage” at Boys and Girls home at Lake Waccamaw. Rotary International Foundation — The charitable arm of Rotary International, the Rotary Foundation’s mission is “to advance world understanding, goodwill, and peace through the improvement of health, the support of education, and the alleviation of poverty.” Our club supports the mission of the Foundation through per capita giving and fundraisers. International Partnerships — Partnered with sister clubs in Mexico to purchase a fire truck for an impoverished village in Mexico, and to purchase and install 25 computers for use by school children in another impoverished village. Also partnered with a sister club in Peru to purchase and oversee installation of an X-ray machine to improve the quality of medical care for those in need. Ambassadorial Scholars — Sponsored an Rotary International Ambassadorial Scholar to complete his graduate degree in Fiji. While there he will continue to serve in the Peace Corps and as an ambassador for Rotary. 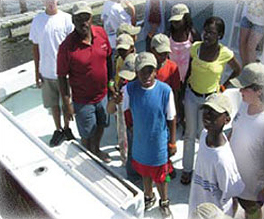 Bob Hodges founded the Take A Kid Fishing Foundation, Inc. 25 years ago with one goal in mind: to provide an opportunity for the disadvantaged and disabled youth of North Carolina to enjoy saltwater fishing off the coast of Morehead City while teaching them about conservation and our ocean environment. 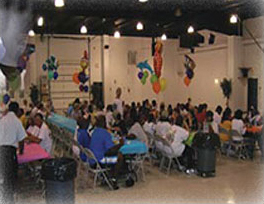 Hodges’s vision has grown exponentially from 35 children in 1988 to 1,000 children in 2006. 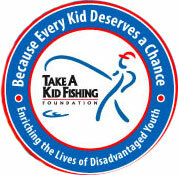 As Take A Kid Fishing has grown, so has its budget and need for volunteers. With an annual cost of $55,000 and 1,000 children to accommodate, contributors and volunteers alike are the lifeline of this Foundation. Take A Kid Fishing cannot express how grateful and appreciative we are for all of our volunteers, contributors and head boats that support our program and Because Every Kid Deserves A Chance change the lives of our children forever by giving them a once in a lifetime opportunity. Since Take A Kid Fishing is solely financially supported by donations, it is organizations like The Swansboro Rotary Club that keep this Foundation alive. Members of the Swansboro Rotary work diligently to not only raise funds, but provide facilities and host events in order to continue its partnership with Take A Kid Fishing. We are forever indebted to the Swansboro Rotary Club for the support they pro- Every Kid Deserves a Chance vide in order to give our children a once in a lifetime opportunity. If you would like to find out more about Take A Kid Fishing please contact Teresa Holcombe at 252-808-8303, P.O. Box 1191, Morehead City, NC 28557 or visit our website at www.takf.org.